US-led air strikes continued to target ISIS militants in Syria and Iraq in recent days, as well as an Al Qaeda-linked group known as the Khorasan Group, US Central Command, the military division in charge of operations in the Middle East, said in a statement on Friday. From Wednesday to Friday, the United States and its allies conducted 19 air strikes against Islamic State in Syria and 16 strikes against the militant group in Iraq, according to Central Command. 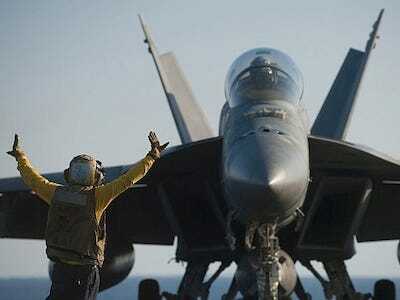 They also conducted one strike against the Khorasan Group in Syria, it said. US air strikes on Khorasan began in September, lumped together with US airborne activity elsewhere in Syria and Iraq. The group was than described as presenting an imminent threat to US homeland security. On September 24, an anonymous US official told Reuters that the group’s leader, the Kuwaiti-born Mohsin Al Fadhli, had been killed in an air strike. In September, US officials justified the strikes against Khorasan by saying that the group was involved in “imminent attack plotting” against the US and Europe. Khorasan is believed to be composed of core veteran Al Qaeda members who are attempting to recruit foreign fighters in Syria to return to their home countries in order to carry out attacks. Khorasan representatives are believed to have played a key role in attempting to bring about a de facto truce between the Nusrah Front — another Al Qaeda affiliate — and ISIS on the ground in Syria. The two groups have been engaged in bitter attacks against each other since ISIS broke away from Al Qaeda earlier this year.